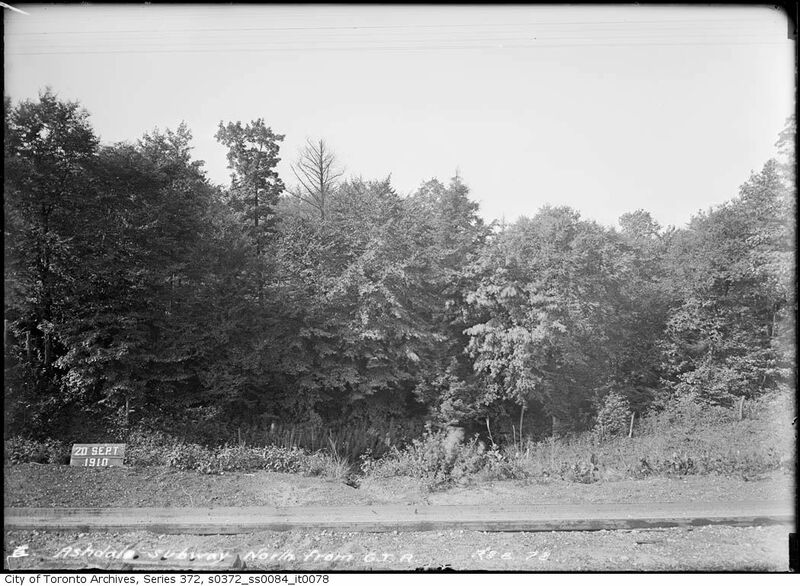 Photo from the City of Toronto Archives, Sept. 20, 1910, looking north from the railway tracks up Ashdale Ravine. “Into the wilds below Monarch Park, where my grandfather would take me for rustic walks in the 1920s.The Ashdale Ravine, as we called it, meandered south from the park between Hiawatha Rd. and Ashdale Ave. toward Gerrard St. E. As we strolled down there, amid a profusion of wildflowers, songbirds, towering trees and sparkling waters, it was very difficult to believe we were still in the city. Ashdale Creek ran through Ashdale Ravine between Ashdale Avenue and Hiawatha. Looking south from the railway tracks down the Ashdale Ravine, Ashdale Avenue is on the left, visible as a wandering trail in the sand. 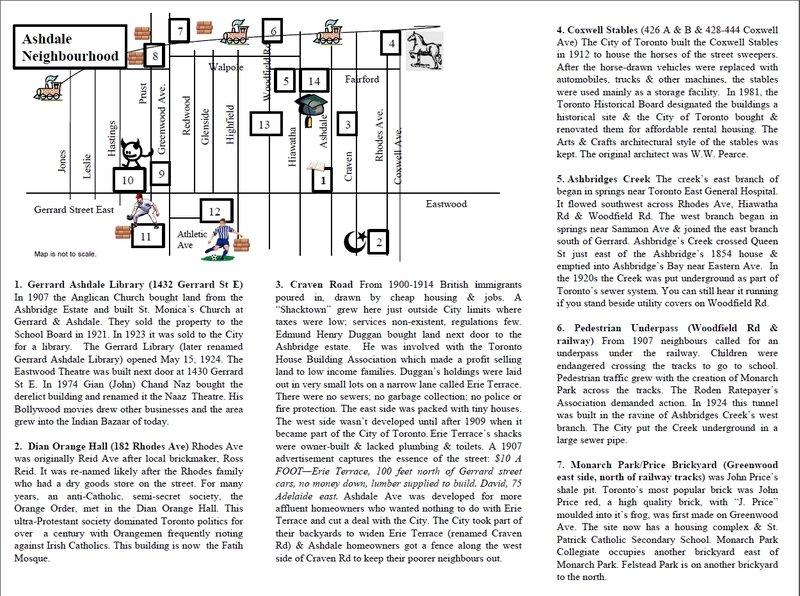 The east branch of Ashbridges Creek started in springs east of Coxwell and north of the Danforth, near where Toronto East General Hospital is today. The soil is sandy so the fast, clear creek cut a deep ravine. On the high table-land was an oak savannah with prairie plants like Big bluestem and Indian grass under centuries-old oaks and towering Red and White pine. But in the deep cool ravine hemlocks threw deep shadows; deer sheltered in the winter among white cedars and alders and willows grew by the brook where Atlantic spawned in earlier days and brook trout rose to flies. Map of Ashbridge’s Creek, from the 1884 Goad’s Atlas. Sam Hill married into the Ashbridge Family. 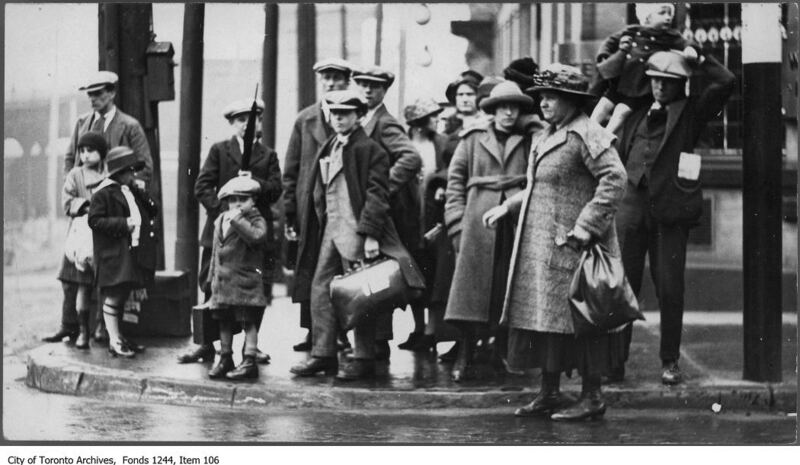 Poor immigrants from England, Scotland, northern Ireland and Wales poured into Toronto in the first decade of the 20th century. Very poor, they usually had little money and their only possessions were what they carried. However, they had high hopes. These were the people that first lived on Ashdale Avenue. Then, as now, there was a disconnect between the images of “the good life” in the media and how most people lived. But in 1907 that gap was much wider as the middle class of shopkeepers, professionals, white collar workers and others was much smaller. Most people worked with their hands and were poor by today’s standards, but the British immigrants were close to destitution when they arrived and totally dependent on getting jobs and affordable housing quickly. A lady of leisure dressed for receiving guests. From an ad in The Toronto Star, Nov. 21, 1908. 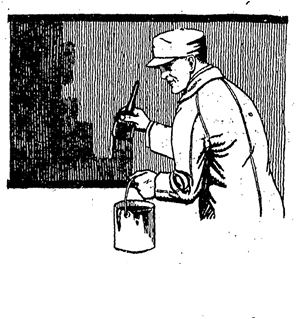 A gentleman from an ad in The Toronto Star, Dec. 16, 1909. How the “other half” , actually the other four fifths lived. From an ad in The Toronto Star, Oct. 29, 1910. 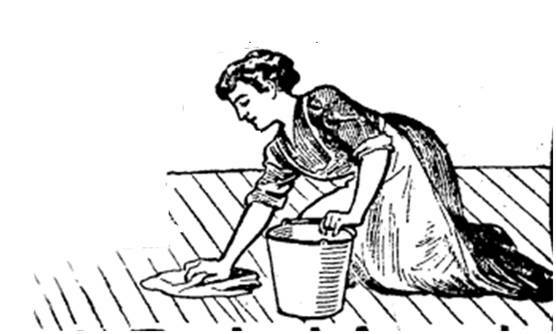 Many of the women who came to Ashdale had been maids in “The Old Country”, a job that they avoided at all costs once they arrived in Canada, to the distress of the maid-less. 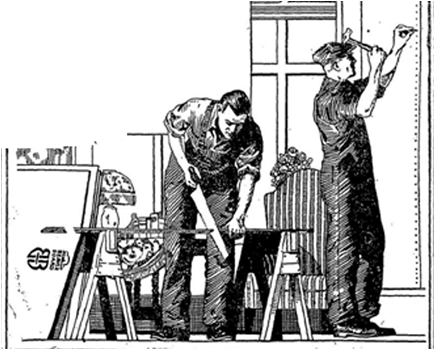 Many of the men who came were skilled tradesmen: carpenters, plumbers, electricians, stonemasons, bricklayers, etc. Unions were weak and labour cheap and plentiful. Though skilled these men earned low wages, $1.50 to $1.75 a day. Jesse Ashbridge and his brother Wellington Ashbridge decided to sell most of the estate that been in their family since the 1790s. While real estate agents handled much of the business, the Ashbridges brothers kept a close watch on developments. 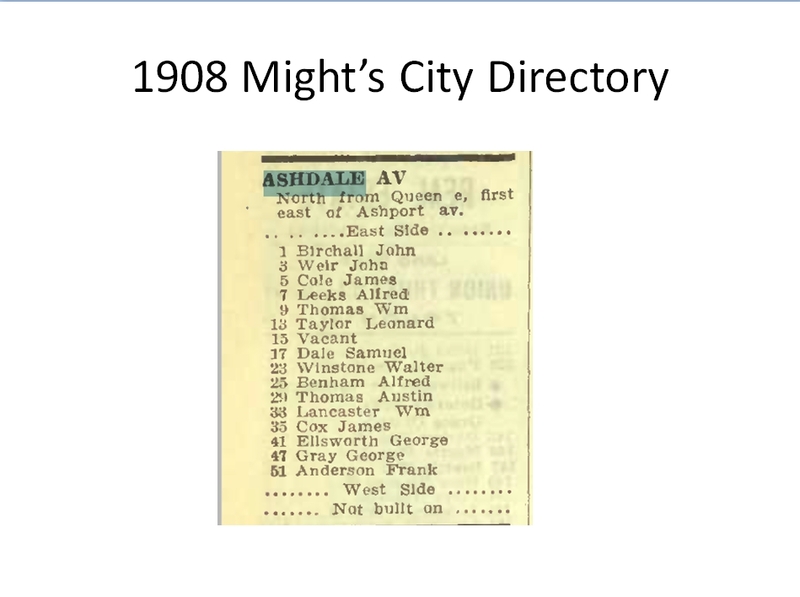 Jesse Ashbridge opened up Ashdale Avenue in April 1906 and named it after the valley or “dale” and his own last name. Jesse Ashbridge kept the ownership of the land between Gerrard and Queen Street, controlling access to the new subdivision that would assure his income now that his days as a brickmaker and farmer were coming to an end. Ashdale Avenue was his pension. The lower part of Ashdale Avenue, the part Jesse Ashbridge kept to himself, was later named Kent. It ran north from Queen Street through the Steele Briggs nursery. 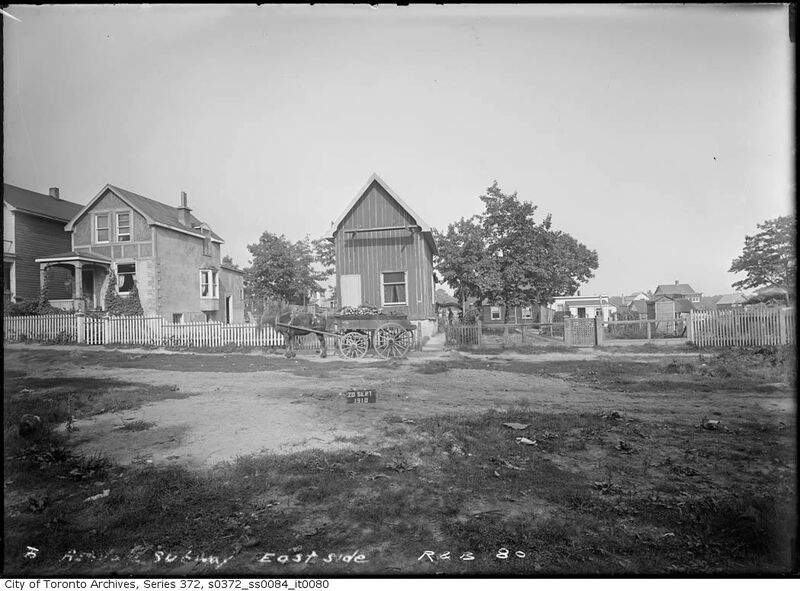 Note the electric streetcar on Queen Street and the Ashbridge’s orchard to the northwest of the Steele Briggs’ stable block. The green fields of the Ashbridges farm stretch beyond. In the far distance there is the smokestack of a brickyard on Greenwood Avenue. The land was essentially like a flat table top tipped higher at the north and lower at the south with the surface cut by the creeks into ravines. 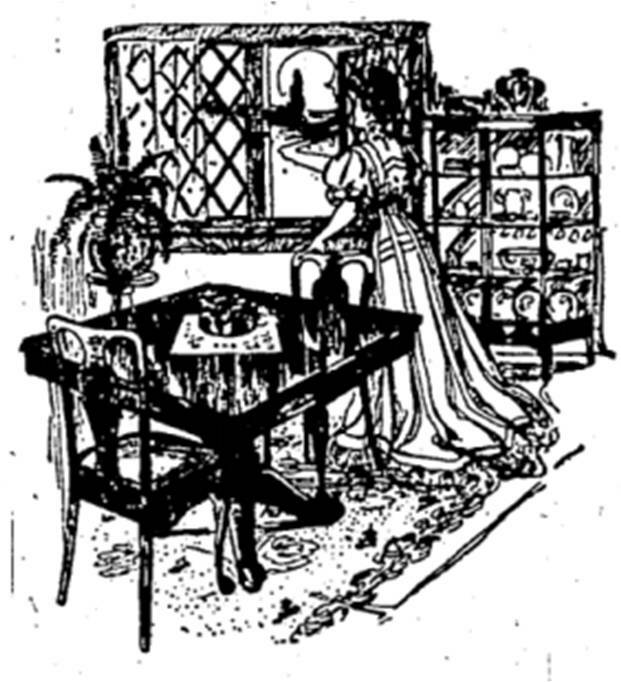 The Evening Record, Dec. 6, 1913, a Windsor paper. 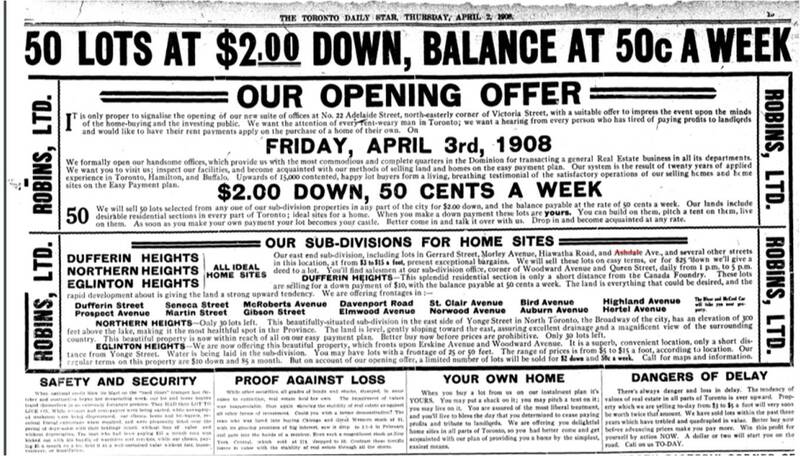 E. Henry Duggan and Dovercourt Land Building and Savings specialized in developing subdivisions at Toronto’s fringes, as it makes clear in this ad: “always just on the edge of the city’s expansion”. Their subdivisions were not in the City of Toronto but in the Township of York without services or infrastructure. No matter. 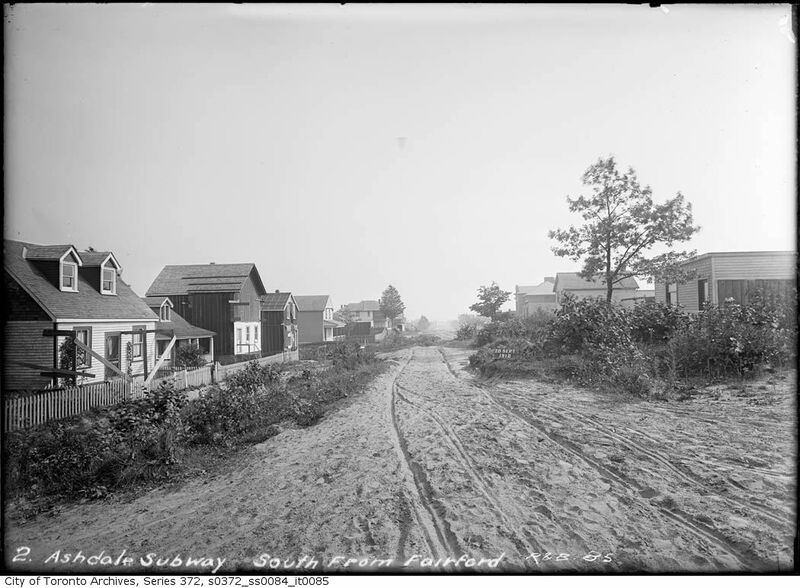 The developer cut Rhodes Avenue into small lots and sold them to the British immigrants who put up their own houses out of whatever they could get. 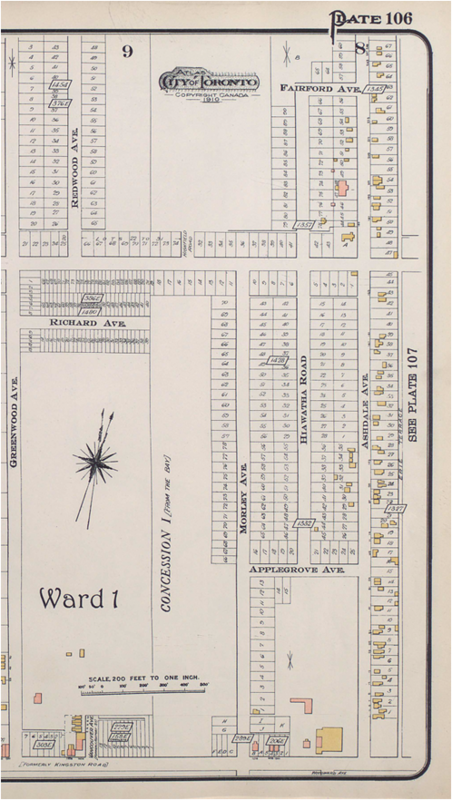 Dovercourt only owned to the west side of Erie Terrace (Craven Road) so they chopped that up into even smaller lots and marketed it to the poorest immigrants, even offering free lumber on occasion. 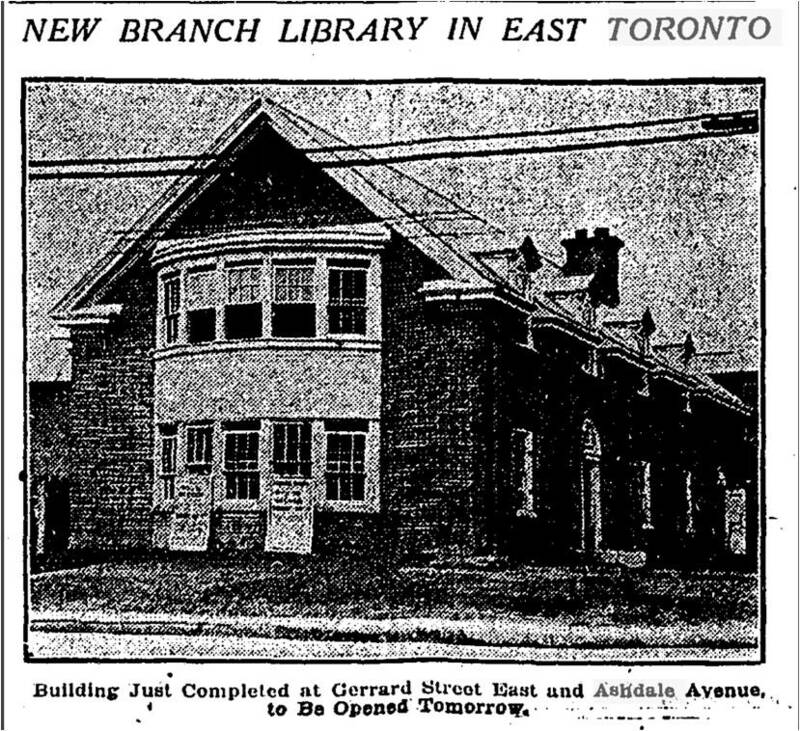 Opening Erie Terrace (Craven Rd) west of Reid Ave (Rhodes Ave), Toronto Star, May 29, 1906. This was a year before the development on the Ashbridge’s farmlands to the west of Craven Road. Essentially it became a Shacktown earlier than the rest of the area between Greenwood and Coxwell. Erie Terrace had an early reputation as a linear slum of cardboard and tar paper shacks — on the east side only. Jesse Ashbridge controlled the west side of Ashdale Ave. He subdivided into it larger lots, hoping to make more money selling to people who could afford just a little more than the folks on Erie Terrace and Rhodes (originally Reid Avenue). 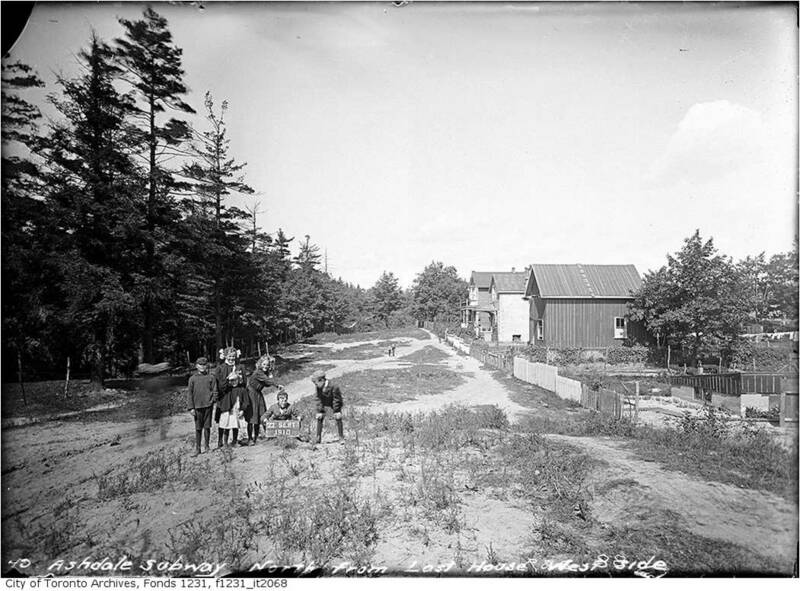 The Township of York did nothing to improve the notoriously difficult roads of the new subdivision although they did not hesitate to collect taxes from the Shackers on Ashdale and the other new streets on the Ashbridges Farm and Duggan’s development neighbouring it. People were on their own except for their family, friends and church as they were to find out the first winter many spent in Canada: the harsh winter of 1907-1908. Owner-built bungalow at the corner of Fairford and Rhodes. Photo by J. Doucette, 2011. In October 1907 the bottom fell out of the economy due to irresponsible speculation on the stock market. The first to be laid off were the new immigrants from England. Then in late November one of the fiercest winters on record struck. People starved in the cold. The Shacktown Relief Fund rescued the people on Ashdale by providing food, clothing, fuel, medicine and even jobs. 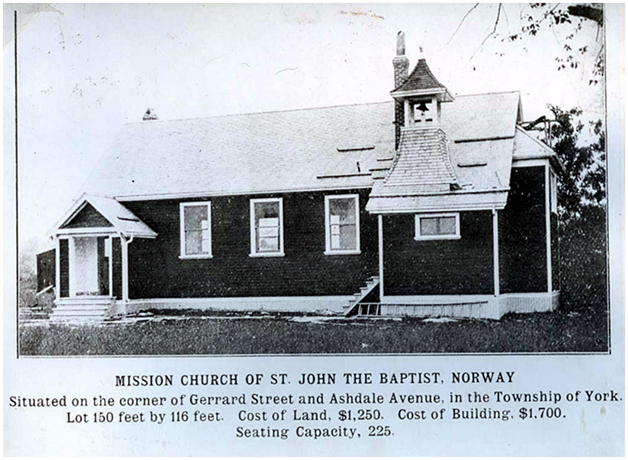 A relief depot operated out of Rhodes Avenue Presbyterian Church while the local manager responsible for distributing relief was the Rev. Robert Gay, at St. Monica’s Anglican Church at the northwest corner of Ashdale and Gerrard. The Township of York seemed to have done as little as possible, but eventually opened a soup kitchen on Coxwell Avenue. 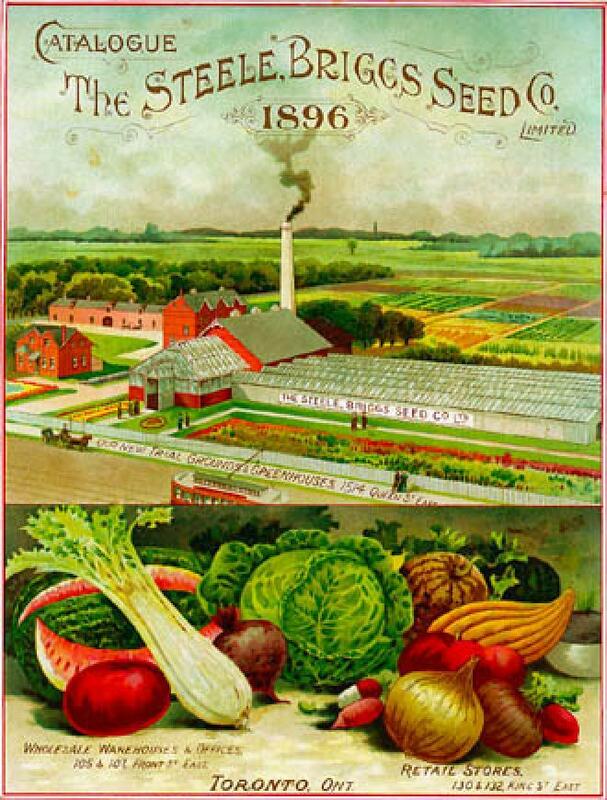 In the spring of 1908 the economy bounced back quickly and with it came jobs. The Shackers stayed and many more joined them, enticed by Robins ads like the one below. Robins was acting on the Ashbridge brothers’ behalf, selling lots, but also giving the credit to buy those lots, with mortgages held by the Ashbridges, at least initially. Our Sub-Divisions For Home Sites. Our east end sub-division, including lots in Gerrard Street, Morley Avenue, Hiawatha Road, and Ashdale Ave., and several other streets in this location, at from $3 to $15 a foot, present exceptional bargains. We will sell the lots on easy terms, or for $15 down we’ll give a deed to a lot. You will find salesman at our sub-division office, corner of Woodward Avenue and Queen Street, daily from 1 p.m. to 5p.m. Credit was cheap and the immigrants had little choice. There simply wasn’t enough housing available. Their solution to the housing shortage was to buy cheap in Shacktown, on streets like Ashdale, and build their own. When national credit blew its blast on the “hard times” trumpet last October and contraction began her devastating work, our lot and home buyers found themselves in an extremely fortunate position. They HAD their LOT TO LIVE ON, While tenants and rent-payers were being ousted, while unemployed workmen were being dispossessed, our clients, home and lot-buyers, received liberal extensions when required, and were pleasantly tided over the period of depression with their holdings intact, without loss of value and without depreciation. The man who had been paying $16 a month rent was kicked out with his bundle of worthless rent receipts, while our clients, paying $6 a month on a lot, held it at a well-sustained value without loss, inconvenience or humiliation. During the hard winter of 1907-08, the Ashbridges did not foreclose on people who could pay, hoping that when the economy picked up they would get their money. So while others were being evicted from their rented houses and apartments downtown, the Shackers were still housed, however inadequately. When you buy a lot from us on our instalment plan it’s YOURS. You may put a shack on it; you may pitch a tent on it; you may live on it. You are assured of the most liberal treatment, and you’ll live to bless the day that you determined to cease paying profits and tributes to landlords. We are offering you delightful home sites in all parts of Toronto, so you had better come and get acquainted with our plan of providing you a home by the simplest, easiest means. Robins, Ltd. 22 Adelaide Street East North-easterly corner of Victoria Street. Office Open Every Evening This Week. What people wanted more than anything else was to own their own home, a value that my own parents shared. Our home outside Toronto in the 1950s had no running water, no heat and no bathroom, just like the shacks of Shacktown. It was, however, a solid old farmhouse and my father soon did the work of installing plumbing, etc., with his own hands — like the Shackers. As long as Ashdale Avenue was outside the City of Toronto, Toronto politicians would not consider doing any work to improve it or extend it. That changed after 1909, but it took many years for the area to gain all of the usual benefits of being in the City. For the first few years, the City provided a water cart for people to get drinking water as their wells were contaminated by the many outhouses. Typhoid appeared on the streets from time to time. 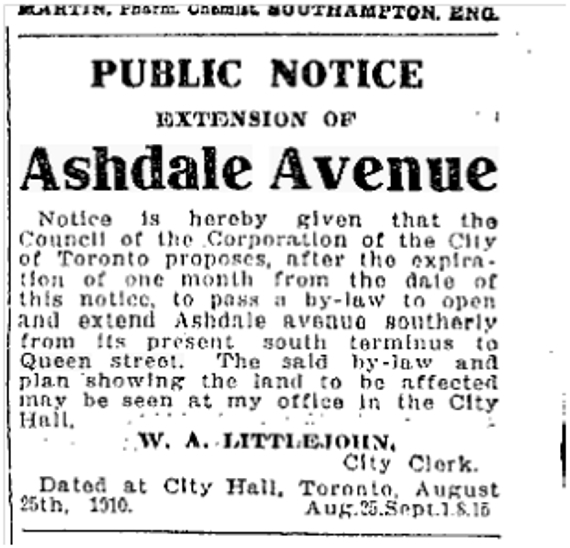 Toronto Star, September 8, 1910 In 1910, despite Jesse Ashbridge’s objections (he put a gate across the right-of-way) and the high price he wanted for that piece of land, the City of Toronto extended Ashdale Avenue from south through his property to Queen Street. Ashdale now ran all the way from Queen to the rail line. The area was idyllic and for many people this was the best place they’d ever lived and the best years of their lives. 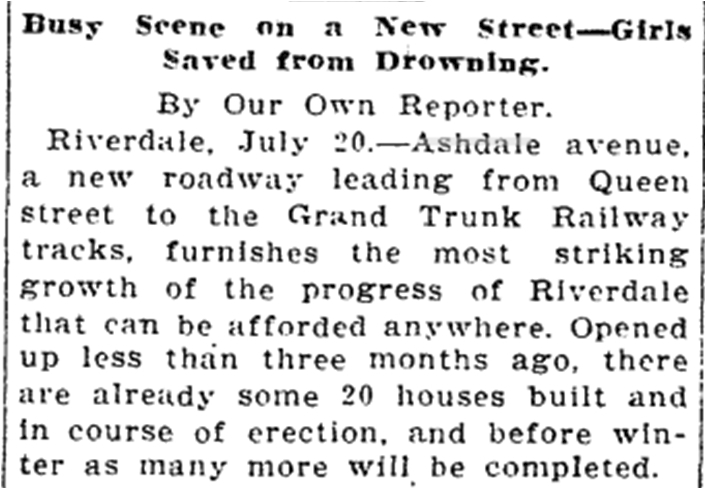 The photos of Ashdale Avenue were all taken by the City Engineers’ Department on September 20, 1910. Children mugging for the camera on Ashdale north of Fairford. We are looking north up the sandy trail that was Ashdale Avenue. 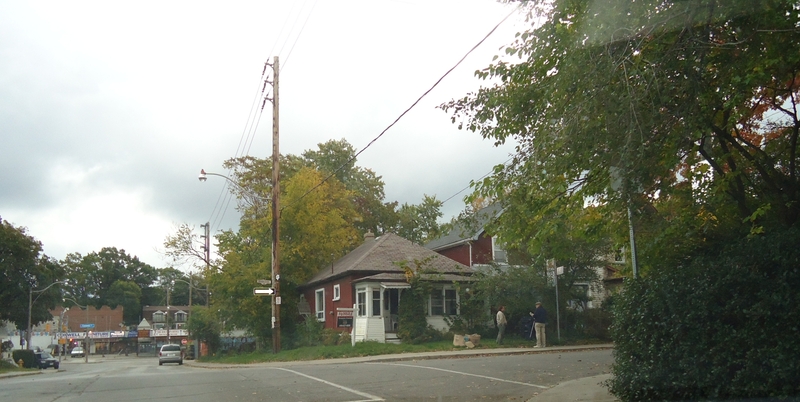 On the right of the photo there is a tar paper structure: a basement that is being used as a home. Often a family would dig a basement (usually by hand) their first summer in Shacktown. Then they would put a temporary roof on it and live in until the next spring when they started work on their house again. More substantial houses are in the background as well as carefully tended vegetable gardens and the pine forest. The substantial house on the left was probably built from a kit ordered from a catalogue, maybe even Eaton’s. 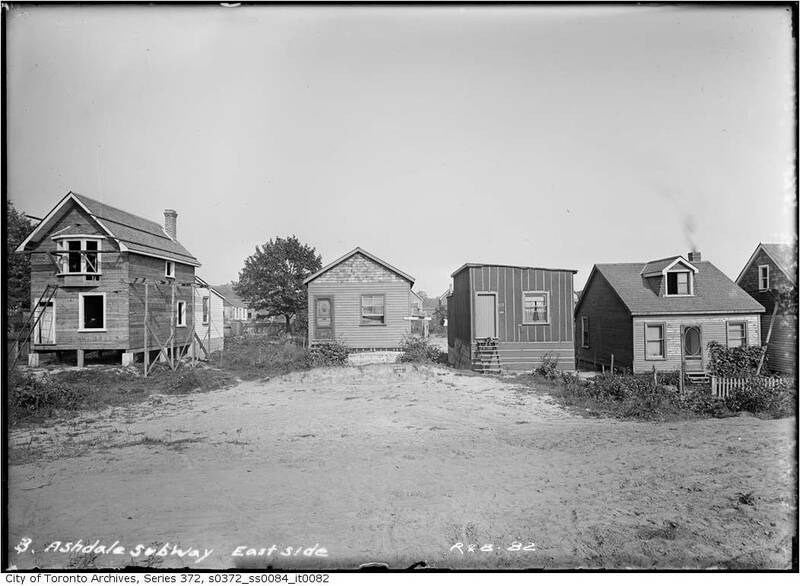 These tarpaper shacks were, in most cases, replaced by sturdy brick bungalows. However, some were simply covered with siding and remain to this day along the streets of “Ashdale Village” as it is sometimes called. A discerning eye might pick out a small house that is shoe-box shaped: an original from Shacktown. 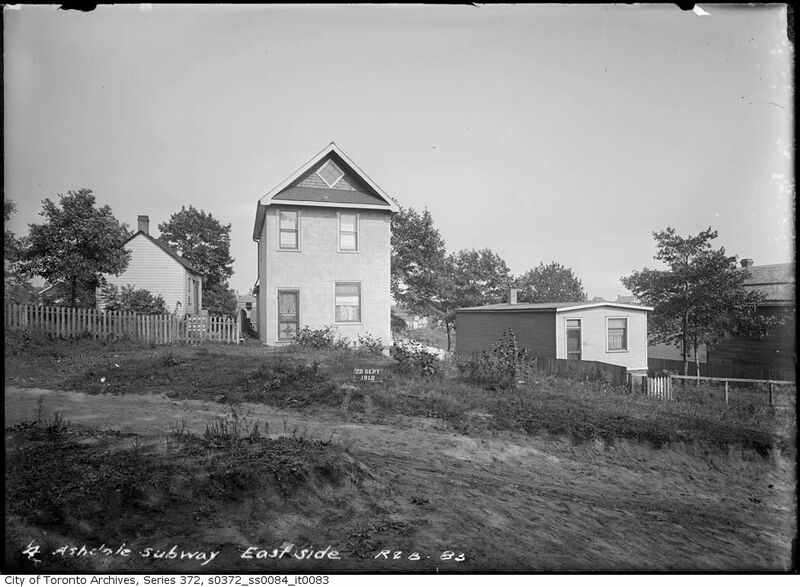 The larger two-storey houses were what realtors called “villas”. Most people built simple one storey or storey and a half bungalows. Bungalows were the fashion of the day. The family that built this substantially villa probably lived in the shack next door while they constructed their “kit house” with the help of their neighbours in a “bee”. 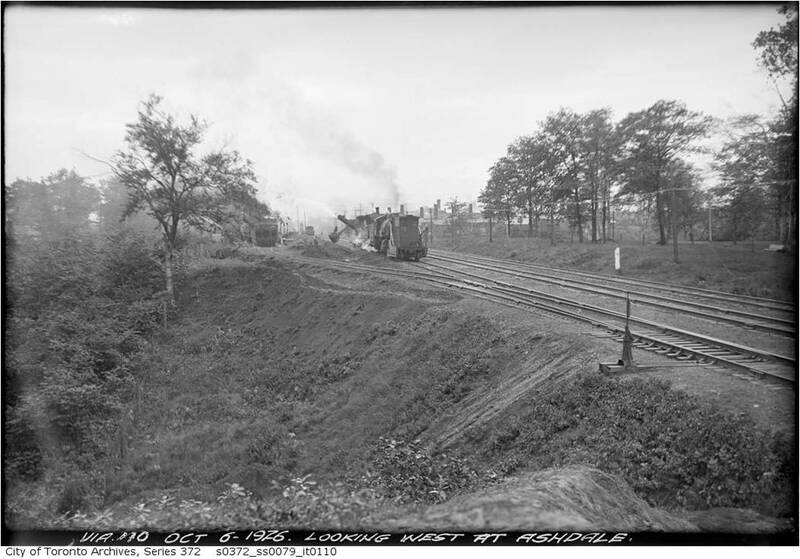 The photo is taken looking westward towards Woodfield Road and the Ashdale Ravine. This is looking westwards at the corner of Fairford and Ashdale. Looking south down Ashdale from Fairford towards Gerrard. Looking east. Their backyards extended to Craven Road (Erie Terrace). When the developers crammed as much as they could onto the narrow north south street that was Erie Terrace, they set up a situation that propagated itself into the future. 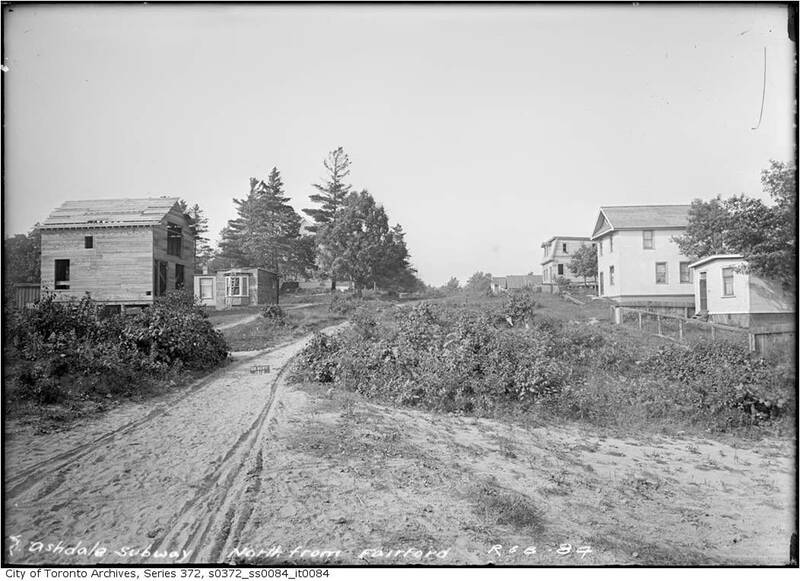 When the City of Toronto took over Erie Terrace in 1909, it was so narrow that fire trucks couldn’t get up it. However, if they took enough room to widen this laneway, the people who had houses on Ashdale Avenue would lose part of their backyards and have little to show for it. Not only would they lose their backyards, but they couldn’t sell them for more housing as the setback was not enough under City of Toronto Bylaws. 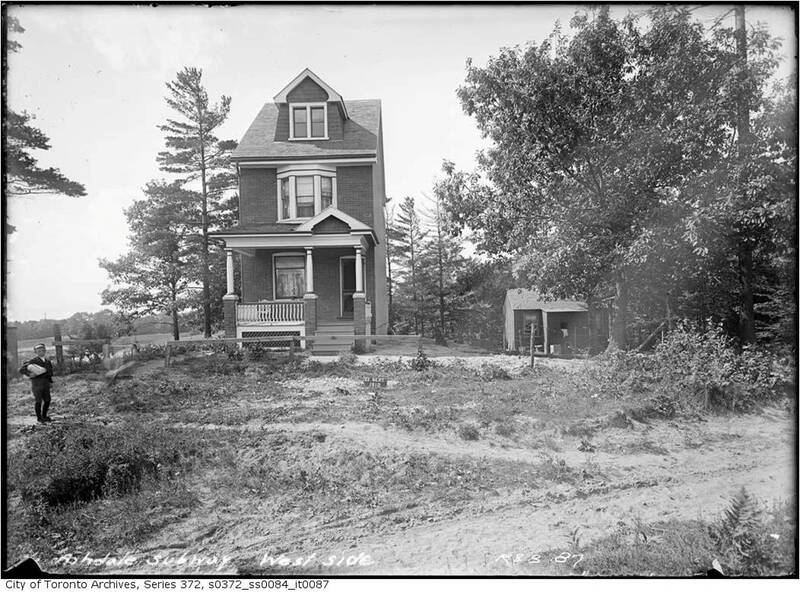 When the City of Toronto finally widened Craven Road (see article below from The Toronto Star, March 25, 1916), Ashdale resident did lose part of their backyards — expropriated. 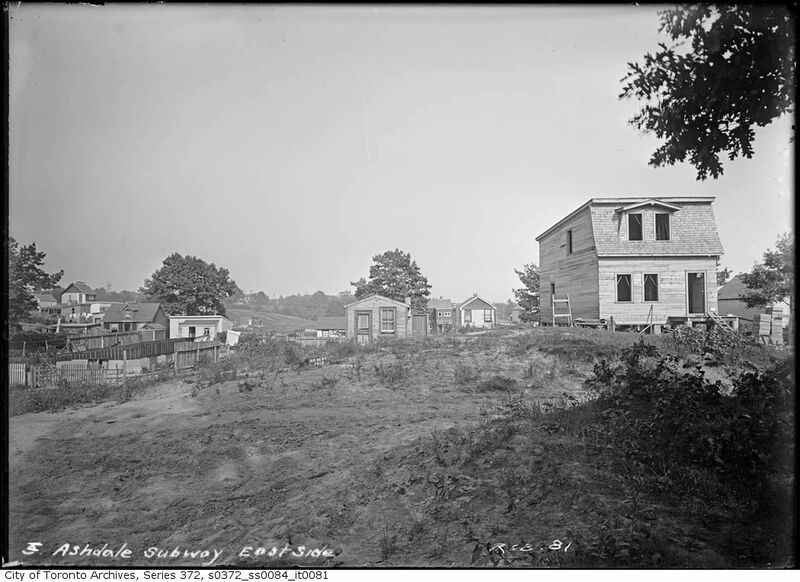 To compensate for their loss, the City of Toronto put up a fence on the west side of Craven Road to keep the ruffians of the notorious “Erie Terrace” out of their backyards. However, those on Erie Terrace claimed it was to keep those people on Ashdale from using THEIR street when they hadn’t even paid for it. In those days the homeowners on a street were expected to chip in and pay for things like widening or paving that street. The City charged it to their taxes so those who lived on a street had a strong sense of ownership over their street. The City maintains the fence to this day. Looking east again. So much of the work was done by hand or by horse and wagon. 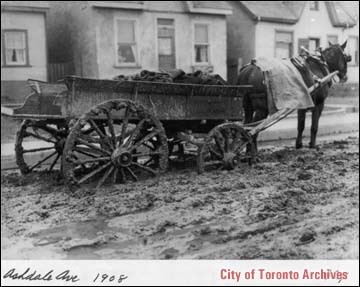 After 1909, when the area became part of the City of Toronto, sewers, sidewalks, paved roads, water mains and telephone and hydro poles installed on Ashdale Avenue. Stores moved in and the area became almost like a self-sufficient village within Toronto. 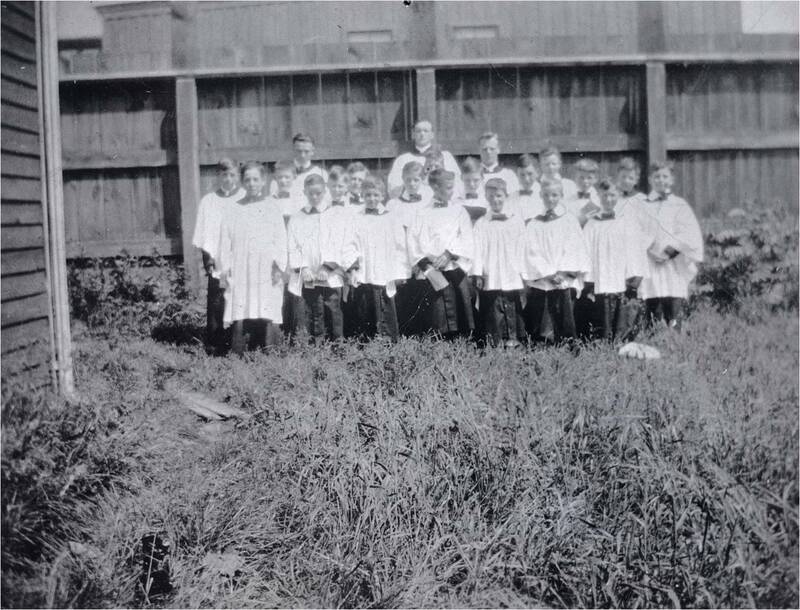 Young students of the four-roomed Ashdale School, Ashdale Ave., w. side, n. of Gerrard St. E., c. 1907, from the collection of the Toronto Public Library. 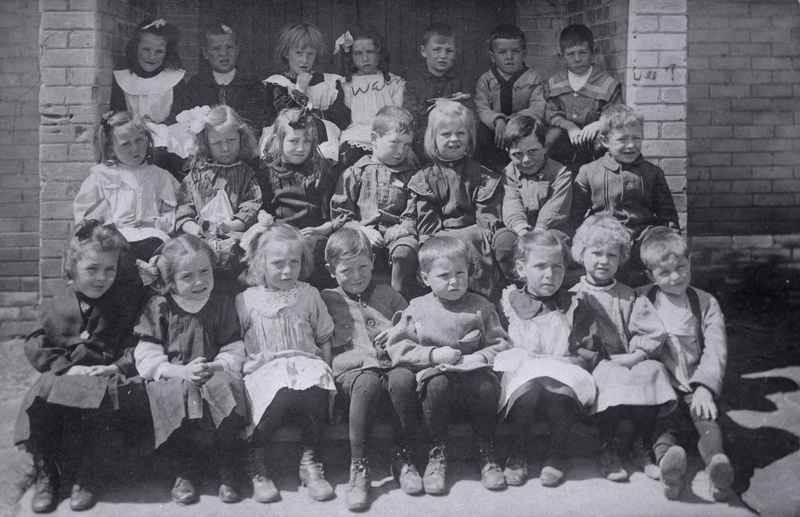 Roden Public School, Ashdale Ave., w. side, n. of Gerrard St. E.; infant class, 1911, from the collection of the Toronto Public Library. 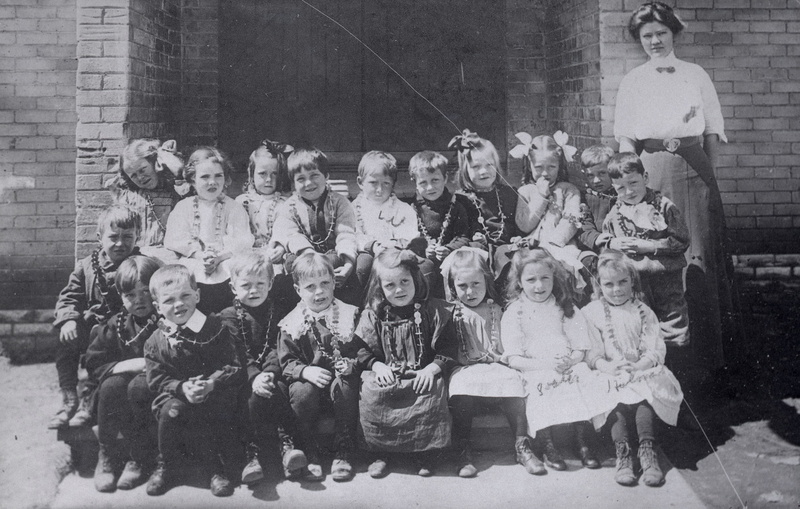 The Ashdale Avenue School, under the Board of Education for the Township of York, was built in 1907 and served Shacktown’s children in its four rooms. The architect of the original 1907 four-roomed brick school was Charles Hartnoll Bishop (1851-1924) and he was also responsible for major additions in 1910 and 1911. When the City of Toronto annexed the area they took over the school and renamed it after a City of Toronto School Trustee, Ephraim Roden. The Toronto Board of Education promptly and with no notice, replaced the woman who was principal of the Township of York School, Emma Whittaker, with a man. 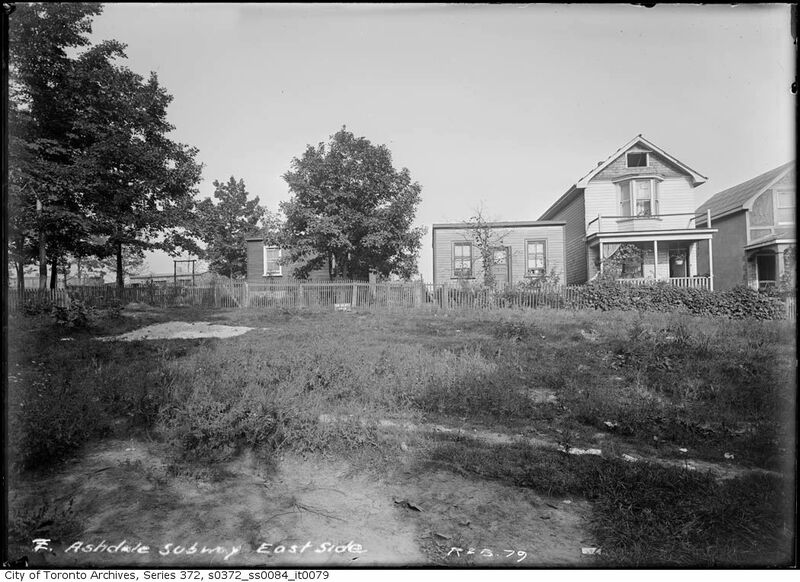 “What is now known as Roden School of Toronto had its beginning in November, 1906, in that section of the County of York known as the Midway, a part wedged in between Greenwood Ave. and the Kingston Road. Norway School being the only school in the district, and full to overflowing, the trustees Mr. J. Brown, Mr. James Jackson and Mr. Samuel Wilson, secured the lecture-room of the new Rhodes Avenue Presbyterian (now United) Church as a temporary accommodation for the overflow, with Mrs. E. Whittaker as teacher. In May 1907 a four-roomed building, which was then deemed to be adequate for all future needs, was started and formally opened in April 1908 with Mrs. E. Whittaker as principal and Misses Snell and McColl as assistants. 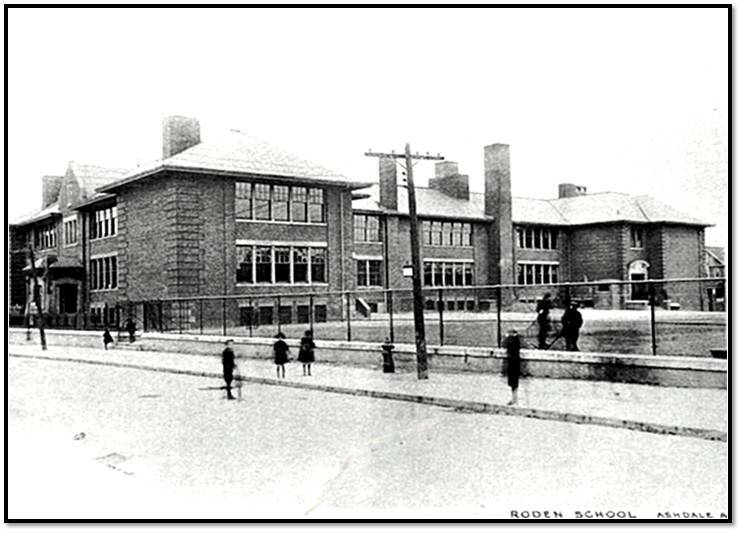 The 1911 Roden School, City of Toronto Archives. 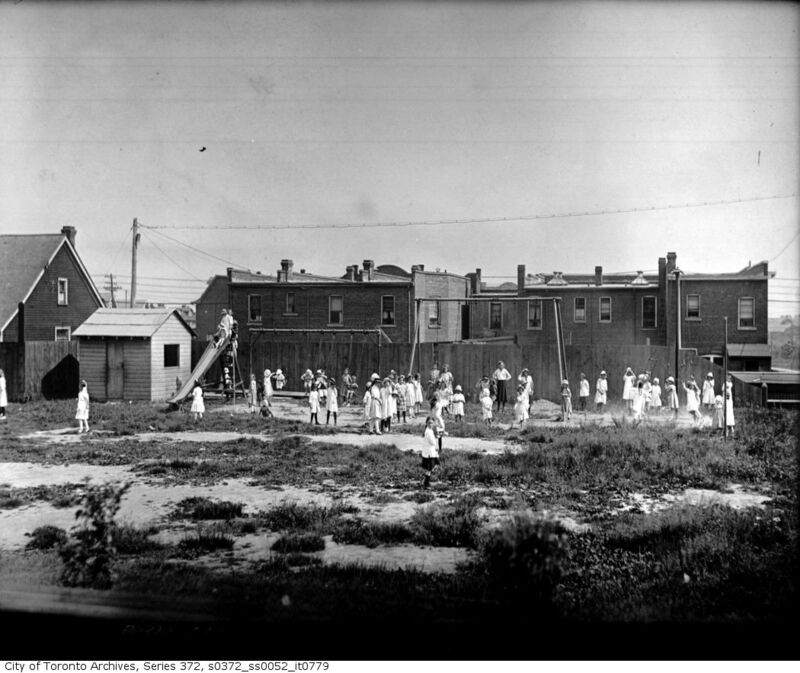 Roden School, 310 Ashdale Ave playground, June 16, 1919. From the Collection of the Toronto Public Library. St. Monica ‘s Anglican Church (1907-1923), Gerrard St. E., n.w. corner Ashdale Ave.; choir. Photo by William H. Jackson, 1910. In the collection of the Toronto Public Library. 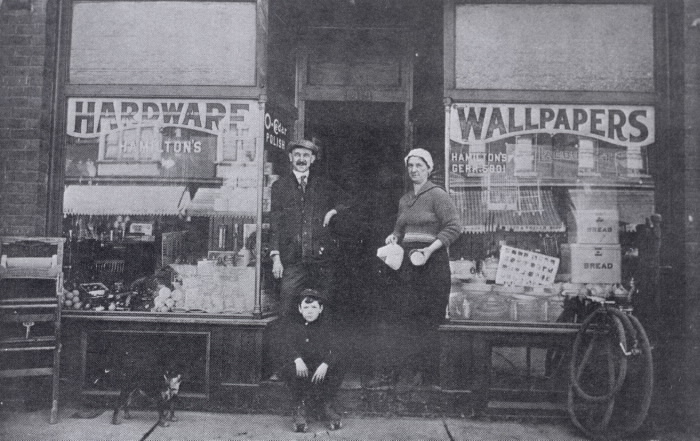 Hamilton Hardware, Gerrard Street, 1920. From the Collection of the Toronto Public Library. 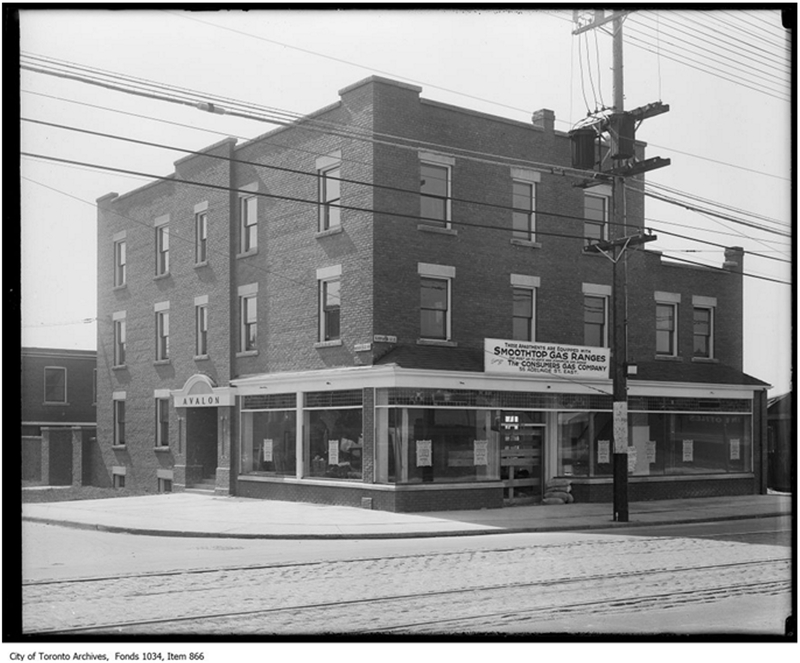 The Avalon at Gerrard and Woodfield, originally a butcher’s shop was where the Islamic bookstore is today. 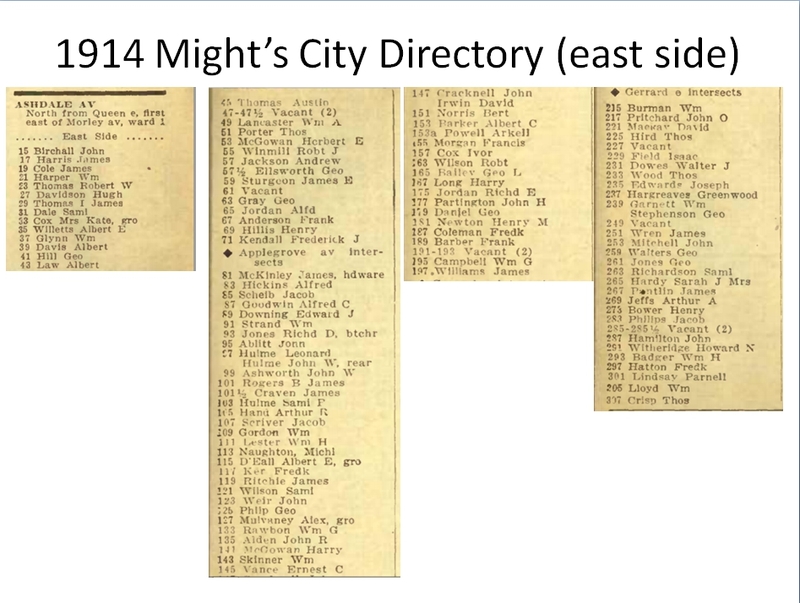 1912 Might’s Directory. 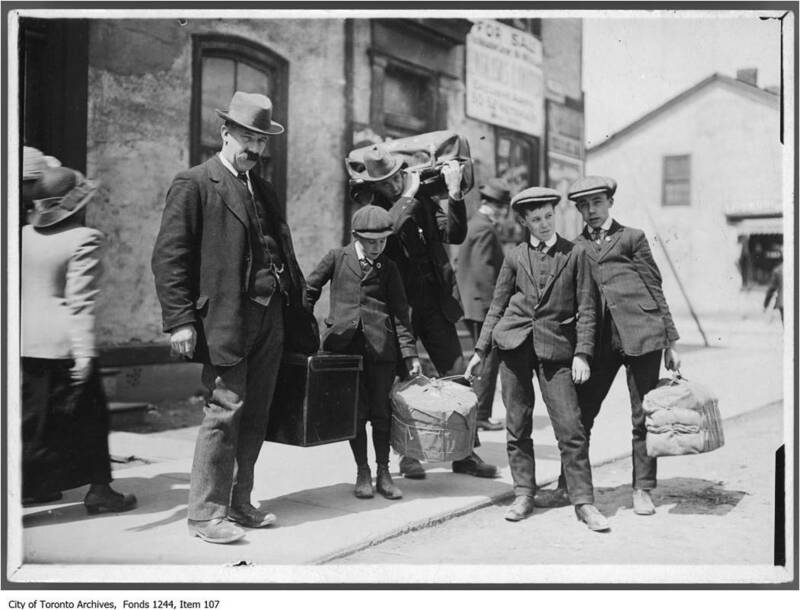 When they joined the City of Toronto, the Shackers got mail service … and advertising flyers. Globe, May 14, 1924. On the site of St. Monica’s Anglican Church. Jack and Polly Love, 401 Ashdale Avenue, represent the families that lived here. They are typical in many ways. They were born in a large industrial town, and immigrated to Canada. He was a tradesman, a house painter. 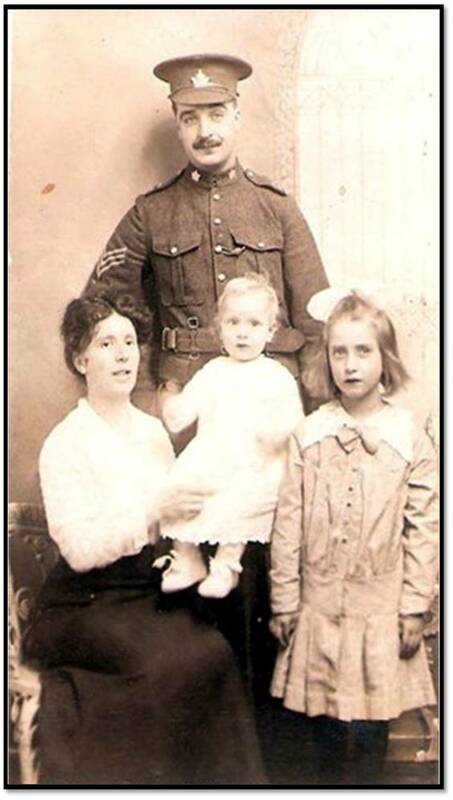 Jack Love enlisted and fought in the trenches, but lived to come home to his wife and children. 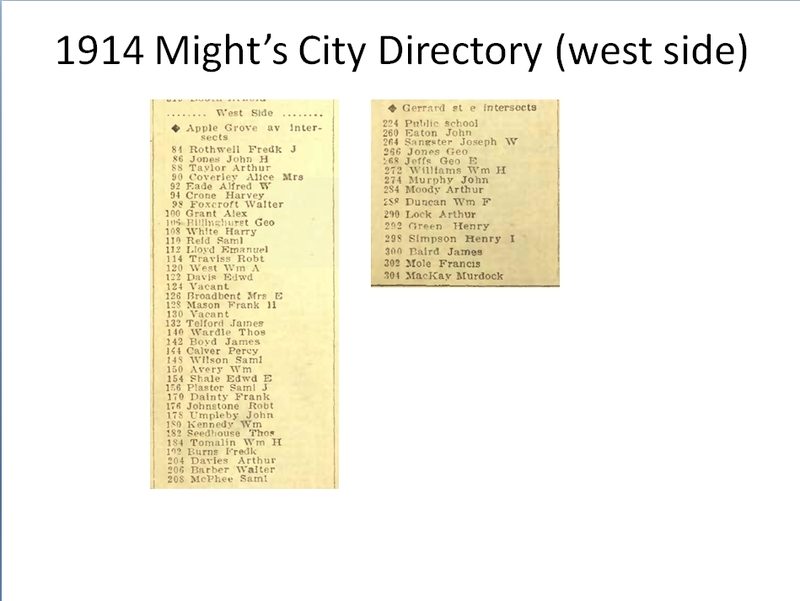 John Cracknell is listed on this Might’s City Directory of 1914. 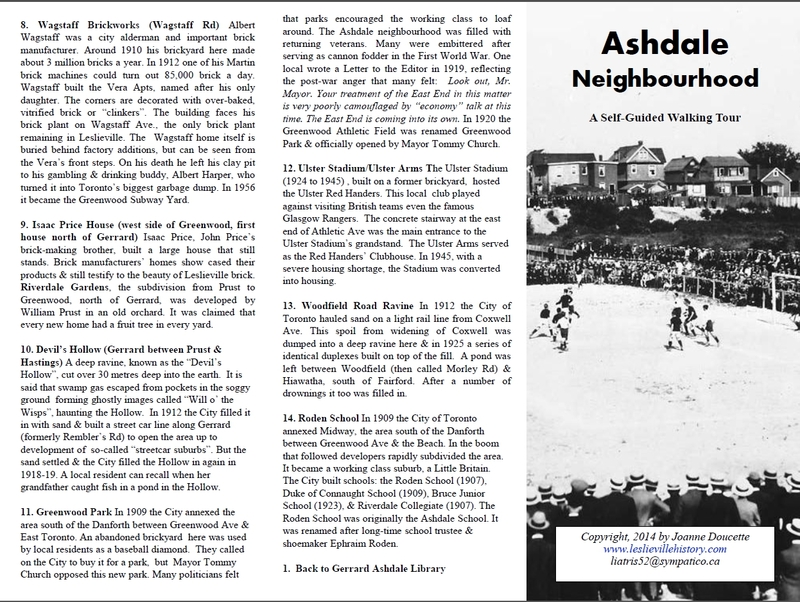 Only “heads of households” were listed Emma Cracknell was one of the people who made Ashdale Avenue special. 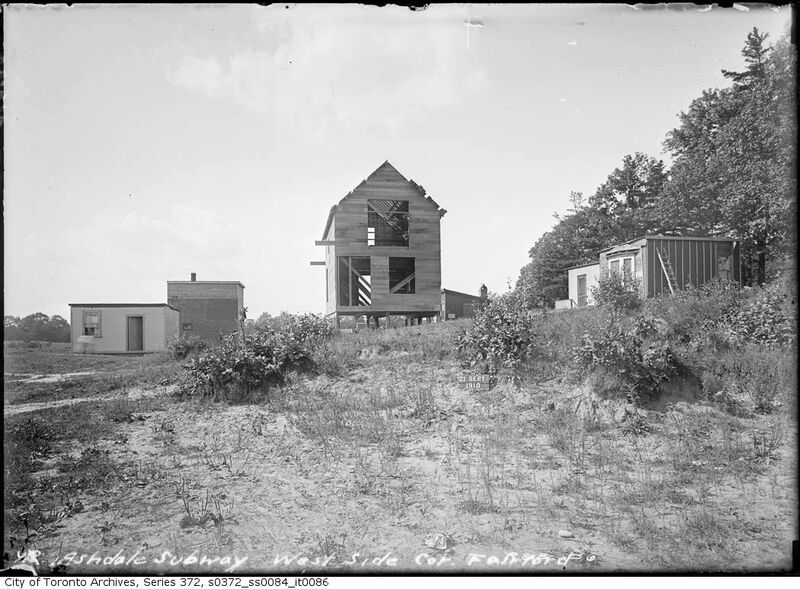 By the 1920s the shacks were mostly gone from Ashdale and realtors were selling solid brick homes, not lots. Lloyd and Leo Pegg, 319 Ashdale Avenue, Toronto Star, Sept. 4, 1926. 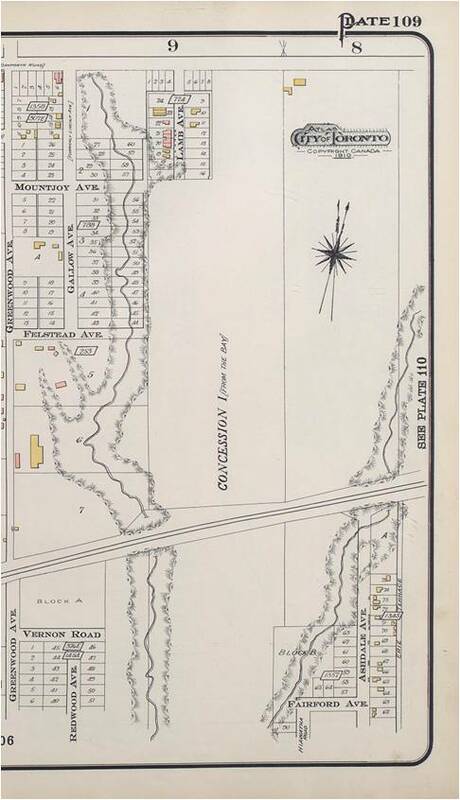 Ashdale Avenue, Goad’s Atlas, 1910, showing Ashbridge’s Creek , both west and east branches and Ashdale Ravine on the right. Vernon Road is now Walpole Ave.
At this stage all the houses are wooden or rough cast (stucco) and are yellow. The only brick building is Roden School (pink).